Earn great rewards and get exclusive specials when you join the Turtle Jack’s Loyalty Club. Not a member yet? Get $10 towards your next meal just for joining! 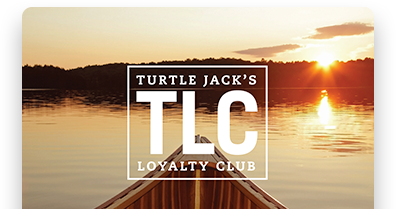 The Turtle Jack’s Loyalty Club (TLC) is our way of saying thanks. As a TLC member, each time you visit, you’ll earn points you can redeem towards your favourite menu items and get access to exclusive member-only rewards. Was your card activated prior to September 3rd, 2014? Sign-up and get $10 off your next meal! Come on over to any Turtle Jack’s Muskoka Grill location and ask one of our team members for a TLC rewards card or request a card online. Then simply register your card online and you’re ready to earn. Turtle Jack’s is a Rewarding Experience. Present your TLC card when dining with us to receive 1 TLC point for every dollar you spend. You can then start redeeming at just 100 points for $5 off your meal. Sign-up for our mailing list for further offers. See the TLC FAQ for more. Earn $5 for every 100 TLC Points. Plus, as a new member you’ll receive $10 towards your next visit after signing up! Being a TLC member also means you’ll be the first to know about new promotions and special events. We’ll mail it to you!